Another month, another Mixology Monday! 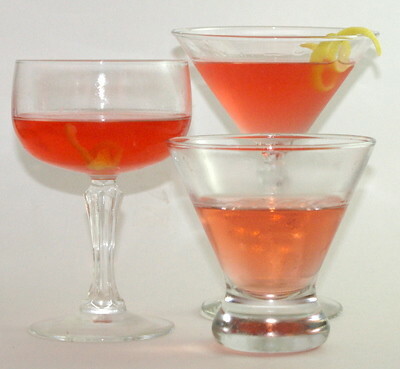 This month, the theme, courtesy of Bibulo.us, is 19th Century Cocktails. I’ve been joking with the crowd over at the Mixoloseum that we all need to claim our page in Imbibe! and go from there. I decided to be greedy and take several. As a long time gin fancier, I’ve been frustrated by my inability to get a taste of genever. For those who don’t know, genever is the source liquor for gin. Made in Holland, it was made predominantly from malted grain, resulting in a sweeter, heavier product than we find in the modern London dry style. In the 19th century, genever was the dominant style of gin, especially as London dry wasn’t developed until the later half of the century. Genever fell out of style in the United States with the rise of the popularity of dry vermouth as a mixer; genever doesn’t work as well in the lighter, drier style of cocktail that became the fashion in the 1890s and later. Until recently, this presented a problem for the modern US-based cocktail geek. Genever has had very limited distribution in the US. For those of us where that means no distribution, it’s either wait for someone to bring a bottle back, or hope for a change. And change is coming! One example is the new product, Genevieve, from Anchor Distilling. Using the same botanical blend they use in their excellent Junipero, they’ve started distributing this new genever-style gin. Which gives me the chance to finally try some gin cocktails in the style Jerry Thomas would be used to. I thought I’d compare the plain, fancy, and improved gin cocktails, as described by David Wondrich in Imbibe!. The Jerry Thomas recipes call for Boker’s bitters, which I haven’t tried to recreate. I decided I’d use Peychaud’s in all three. Also, I don’t have any gum arabic to make a proper gomme syrup. As many comments focus on the toothiness that gomme syrup brings to the drink, I decided to use agave nectar as the sweetner, as I find that brings an enhanced mouthfeel over simple syrup. stir ingredients over ice, strain into cocktail glass, twist lemon peel over glass and throw away. This is an enjoyable drink, if a little plain. The maltiness of the Genevieve really plays through, as well as the botanicals. stir ingredients over ice, strain into cocktail glass, twist lemon peel over glass, moisten rim with peel, and throw into glass. As always, it’s very instructive to see how little of an ingredient can make a huge difference. I really like the depth the curaçao brings to the drink, as compared to the plain version. This is quite a busy cocktail. The maraschino funkiness is there, but to my palate, it competes with the Genevieve rather than complimenting it. I’m not quite sure the absinthe brings much to the party either. I’m definitely eager to try the fancy and improve versions again, starting with different bitters. And as soon as I can get my hands on some real Dutch genevers, I’ll get to know how close the Genevieve is to the real thing. This was definitely an enjoyable experiment for me. Be sure to check back with Bibulo.us to see the rest of the round-up. I agree with your take on the Improved Gin Cocktail. I’ve tried it myself with genever, and I can’t say that I enjoyed it very much. By the way, you’ve got great photos. Would you mind sharing how you set up your shots? Thanks for the kind words, Fred. I use a very inexpensive homemade lightbox and all the lamps I can scramble together. I set up the drinks, then take tons of photos, usually using the flash as well. I use Google Picasa for my photo editing. Light the is big key. Take a few test shots, rearrange the lamps if you need to, and just keep playing.